The Church of Saint Peter and Paul was opened in 1847. The church was built in Gothic style. It is made of Limestone from Mountrice Quarry. It is a very beautiful church. The church has beautiful stained glass windows, the Rose Window being one of them. At the altar there is a stained glass window of Saint Evin. St. Peter is on the right and St. Paul is on the left hand side of the church entrance. 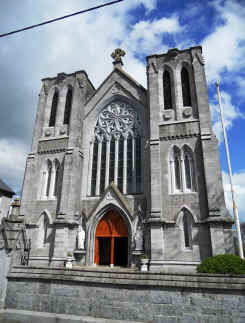 The Stations of the Cross in the church were donated by one of the Cassidy sisters, Mrs Eleanor Wheble, in memory of her husband, Daniel O’Connell Wheble, and the two marble side-altars were erected at the expense of the Cassidy family. Father Liam Merrigan is the Parish Priest.